In our church kid's program last week, we went over the 10 commandments, reading them out (loudly!) from a screen. They were written in kid-friendly form, a single sentence for each commandment and the last one in particular really caught my attention. "You must not covet your neighbor’s house. You must not covet your neighbor’s wife, male or female servant, ox or donkey, or anything else that belongs to your neighbor" (NLT). "No lusting after your neighbor’s house—or wife or servant or maid or ox or donkey. Don’t set your heart on anything that is your neighbor’s" (The Message). But our list at Kids Klub simply said, "Don't wish for other people's stuff." Don't wish for other people's stuff. How much time do we spend wishing we could have what other people have? Sometimes it's actual physical stuff, but not always. Sometimes it's the other stuff, like when other people travel frequently and I wish we had the freedom that comes with being retired. Or when I see other quilt designers who are visiting guilds to teach and I wish I were being invited to teach, too. Maybe you have young children and you see people whose kids are grown and wish you could sit and enjoy a cup of coffee in peace like they can. The problem with wishing for other people's stuff, physical or otherwise, is that it is the opposite of being thankful for what we already have. We can't wish for more or even just for something different and feel thankful for what we have at the same time. Every moment of wishing we had something that others have is a moment of feeling like what we have is not enough. The more time we spend wishing for other people's stuff, the more dissatisfied and discontent we become with our own lives. That is definitely not what God wants for us. Instead, He wants us to focus on gratitude. Paul wrote, "Be thankful in all circumstances, for this is God’s will for you who belong to Christ Jesus" (1 Thessalonians 5:18). It's not the amount of stuff, or even which stuff, we have that makes us happy or unhappy. 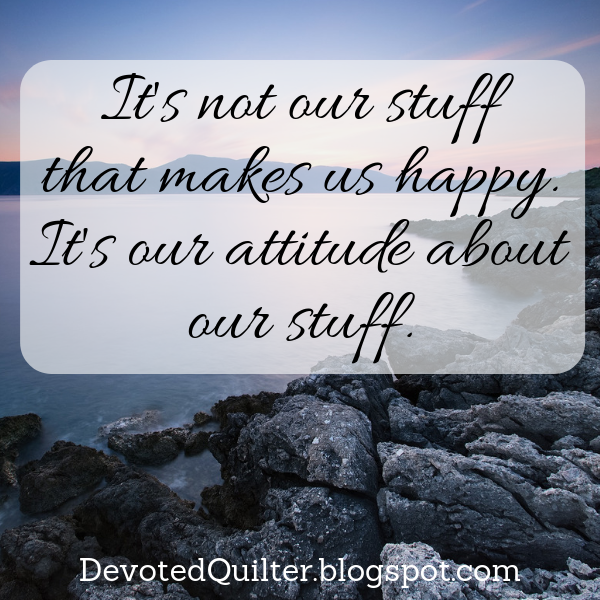 It's all about our attitude about our stuff. No matter how much we have, there will always be something more we could wish we had. Or we can make the choice to be thankful for what we have and not spend our time wishing for other people's stuff. Amen!! It's sometimes hard to remember to be thankful for the little things and to take things for granted. Have to remember not to get caught up the in busy-ness of life. This was very timely for me. When I visit others' homes this time of year, it's hard for me not to covet their furniture, home decor or lifestyle. Then I see the news about all who have lost everything due to wildfires and floods. Thank you for this helpful look at one of the Commandments. It's always fascinating how making things 'simple' for children often directs us right to the heart of the meaning! I sometimes get more out of the 3 minute slot for children at the start of our Church service than the 30 minute sermon!But I am thankful for both!